They called it Madre de los Pescados, the Mother of the Fishes. To this day, peering from the side of our outrigger canoe, or banca, and into the clear water — an embarrassment of fish swimming in large schools just beneath the surface — it’s easy to see what inspired the Spanish to give Bantayan Island its enduring nickname. The island has enough fish to sustain an entire local industry, with a surplus of it to make dried fish. Dried fish — cured in salt and dried in the sun — is synonymous with Cebuano delicacies and de rigueur pasalubong, and approximately 70% of the dried fish supply of mainland Cebu comes from this small island. But Bantayan is known for something else. Take a scenic three-hour drive to the north end of the Cebu mainland, followed by an hour-long ferry ride across the channel, and you arrive at this flat, 109km2 island, a popular sun-and-sand destination with only three main towns — Santa Fe, Bantayan and Madridejos. Tourist arrivals, mostly from nearby islands, peak around Holy Week preceding Easter Sunday, a movable celebration which falls in the months of March or April. Today we’re on an island-hopping tour, a favorite among tourists hankering for a private island; an illusion of owning a piece of paradise, if only for a few hours. Our little banca rides the frothing waves in the balmy tropical heat for an hour out in the Visayan Sea, speeding towards a small islet called Mambacayao Daku, one of about 20 along the western coast of Bantayan. Because the tidal flats are wide in Bantayan, the bottom is shallow and reflects a cool green on the surface instead of the dark, ominous blue of deep water. We pass through a ring of coral reefs surrounding the island that, on any given day, teem with fish. Despite its burgeoning tourism, centered on the town of Santa Fe on the eastern tip closest to the mainland of Cebu, Bantayan has kept to locally owned resorts and hostels for years. The vibe is certainly small-town-meets-world, with a smattering of three-table bars done in bamboo and thatched nipa roofing, complementing a popular entertainment square with food outlets manned by Greeks, Italians and Spaniards, alongside Filipinos. Many of these entrepreneurs arrived as tourists lured by the beaches but stayed for the incomparable charm and thrifty living on a small island not far from a major metropolis. “We are at the very navel of the country,” says Vince Escario, the tourism, sports and cultural development consultant to the town of Bantayan’s local government, over the motorboat’s din. “When the Spanish occupied the Philippines, they already knew how strategic the location was, and they founded one of the very first parishes in the country here in 1580.” Then known as the Convento de la Asunción de Nuestra Señora (Convent of the Assumption of Our Lady), the parish church exists to this day in the center of town as the Sts Peter and Paul Church, the former apostle a fisherman. “At that time, the parish jurisdiction reached as far as Guam!” Vince adds. Catholicism retains its grip on the island’s traditions, especially during Holy Week where centuries-old icons are paraded on the streets packed with both worshippers and tourists. Because most of the townsfolk are fishermen, they refuse to fish during the days of abstinence from work and pleasure, leaving them with only meat to eat. A special dispensation from the Vatican had been granted in the 1840s, allowing the consumption of meat even during Holy Week. But not unlike the ocean that sustains it, Bantayan has a trove of secret pleasures reserved for those who make the effort to find them. A sharp contrast to the readily available high-flying skydiving tours from the island’s small airstrip — or its neon-lit nightlife and the popular Ogtong natural cave pool — some attractions bank on their stark simplicity and relative inaccessibility. That’s the draw of Paradise Beach and its eerily still waters, a privately-owned stretch of white sand currently devoid of permanent man-made structures. It encourages the pitching of tents at an adjacent campsite as accommodations. The beach itself is accessible by a 15-minute trek on a moderately rough path that cuts through shrubbery. Then there is the thrill of a 6m cliff at the Ruins, in a public area a few kilometers from Paradise, where you can launch yourself from an outcrop of razor sharp coral rock to break green and blue water below. There is also the intimate discovery of how life is lived in a small fishing village on an islet. Traversing a circuitous and meandering route, undertaken to avoid the shallow areas between islets, we land on a shape-shifting sandbar on the southwestern side of Mambacayao Daku. 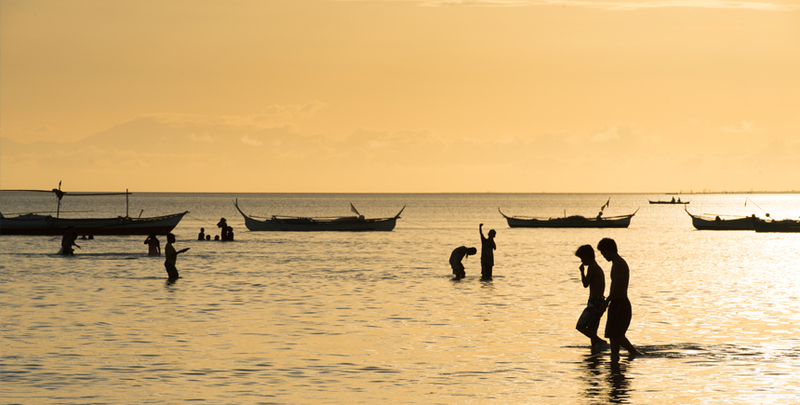 During the less treacherous amihan season, when the northeast trade winds blow from September to May, boys flock to the sandbar’s edge just a few steps from shore, waist deep in water. They whirl a 3m-long nylon line with a hook at the end over their heads, baited with pieces of octopus meat, and hurl it as far as they can without falling off the steep underwater precipice. The fish always bite, and the boys return home with snappers, parrotfish, crabs, shrimp or small tuna for a meal straight from the sea. “During the habagat (southwest monsoon), the sandbar moves to the back of the island,” explains resident Baby Cañete, pointing to the quieter, uninhabited northeastern side of their tiny islet marked by a solitary dakit tree on a coral stone cliff’s edge, a survivor of Typhoon Haiyan’s destructive force. Despite its qualifier “daku”, which means “big”, the entire islet can be explored on foot in a little under an hour. “This islet has 82 households within 17.8 hectares,” Baby adds, providing precise facts about her home as only an islander can with their complete awareness of their immediate surroundings, an affinity and skill lost by most city slickers. As dark clouds roll in on the horizon, the boatman expertly weaves through shallow breaks and farms of eucheuma, a seaweed prized in cosmetics and food processing, sailing past the other islets. On one of the larger ones, a relic of the Spanish colonial past, survives with the original stone base of a watchtower visible on the tip of the island, still standing guard after four centuries. These once imposing structures, built as lookouts for pirate vessels, were known as bantayan sa hari — “watchtowers of the king” — and are central to the main theory proposed on how the island was christened. This one watches silently as our garrulous banca outruns the storm. Trust a Bantayan native to show you the subtle differences between different types of dried fish. Labtingaw refers to both the method and kind of dried fish that’s exposed to the sun and salted in less time than ordinary buwad (a term which literally means “to dry under the sun”). It’s fleshier and saltier than the more popular kind of dried fish, danggit (butterflied rabbitfish), which goes through the regular sun-drying process and is therefore more dehydrated. Deep-fried to a crisp then served with your choice of egg or garlic fried rice and a dipping sauce of spiced coconut vinegar, it’s the best way to start your day on the island. The resort offers signature Bantayan dishes every day. For a P200 cooking fee, households in the fishing village can whip up a simple, sea-to-table meal of seafood you can buy at cost from them — fresh crabs, barracuda, swordfish, tuna, squid, octopus, prawns, clams and exotic shellfish — grilled in a backyard hearth. They’ll even toss in a salad of seaweed, seasoned with ginger and a dressing of spiced vinegar, for the perfect midday meal. For dessert? Deep-fried skewered bananas coated in caramelized sugar. Bantayan is also the egg basket of Cebu, and it has a ready supply of culled chickens past their egg-laying prime. The result is a curiosity: chicken ovaries filled with undeveloped eggs that will never be laid and have yet to form shells. Called tago-angkan (keeper of the bloodline), they are skewered on bamboo sticks, barbecued on a grill and basted with a mix of soy sauce, vinegar, chili and sweet ketchup during and after grilling. Served with pusô (rice cooked in a diamond-shaped casing of woven coconut leaves), it tastes like chorizo stuffed with boiled eggs. We recommend Anika Island Resort — a modern, family-friendly resort — just five minutes from the port, along F Roska Street, Santa Fe (anikaislandresort.com). To explore Mambacayao Daku and other Bantayan islets, contact the Municipal Tourism Office of Bantayan at +63 948 457 7663 (for Garry Fernandez) or +63 939 233 3333 (for Vince Escario).